For many people this is one in the same question … Juan y Andrea, Beso beach, El Pirate and so it goes… But an increasing number of day charters are looking for alternate options that allow them to max out their time on the water and explore unchartered territory. If you are one of these people who want to explore the caves or visit Es Vedra but you don’t want to be fussed with self catering or want to compromise on quality we have the perfect solution for you. 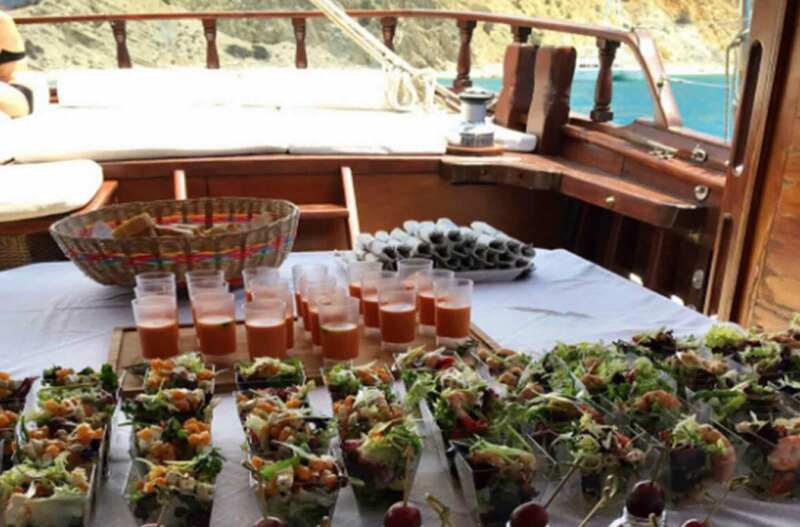 We have teamed up with Gracella and Charles, Spanish team who own and run Catering de Charles to bring fresh gourmet food directly to your boat. Together they have helped us develop an 6 exclusive 3 course menu’s designed specifically for Lux Charters Ibiza. Their food is prepared on the day of your charter, and delivered to your boat in a climate controlled container, ensuring max freshness. All you or your hostess need do is open and serve. Each meal is individually prepared in boat friendly containers. For full menu please visit our on board catering page, or you can download it here.